Crayon Box Quilt Studio: Let there be light! This year I didn't ask Santa for many quilt related things but there is one item that I truly hoped to receive and Santa didn't disappoint. 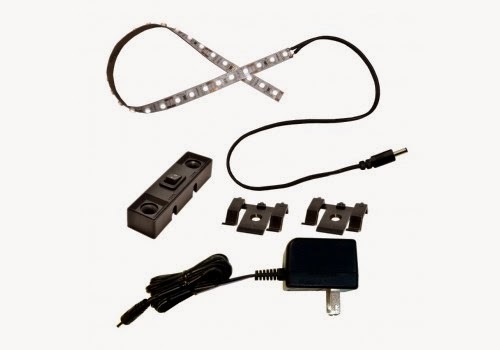 What I really wanted was a Sewing Machine LED Light Kit from Inspired LED. While I do love my Lucy, like most sewing machines, her built in light isn't all that great. I took these photos in the evening so you could see just how dim it is, even with the big overhead light I have in my studio. Even while sewing during the day, I usually turned on my tulip OTT light that sat in the front of the machine to my right. When I needed even more light on my sewing table like at night, I typically would have to turn on my other OTT light that sat at the back of my machine. All of this made for adequate lighting but a lot of lamps and a cramped work area. The LED light kit changed all of that. The light strip was easy to install and I was able to cut it as long as I wanted. Look at all this glorious light I now have shining directly on the table. Here's the best part.....all those extra lamps have been removed and there is much more open space on my right for my other sewing notions. I'm now one very happy lady and am looking forward enjoying lots of enlightened sewing time in the coming months. If you too need more light for your sewing machine, you might want to give this LED light kit a try. This one costs a lot less than others that I've seen listed on Ebay plus it comes with 25 inches of LEDs so if you have extra left like I did, you can get the expansion kit to use the rest on another sewing machine. My Penelope's upgrade already gave her a fabulous LED light so I think I'll use my leftover strip for Abby, once I get her set up somewhere for the kiddos to use. Let there be light! That looks great now. I'm like you... lots of smaller Otts around the machine make it all kind of clumsy. I'm always tipping one over. Thanks for the tip...I may have to look into this. Looks god and bright. I have one of the first LED lights and LUV it. I can move it to another machine...and for retreats rth at have crummy lighting...LEDs are amazing! Happy New Year my friend! I LOVE these lights. I had them on my longarm before my upgrade and they even made me a custom set for my regular machines. Amazing what I can see now. that looks interesting. I bought a tiny little light to attach to my machine, but I've never installed it. Maybe I'll do it today! Have fun with all your new light. Lighting is so important. It looks wonderful. Looks great Michele!! I have a black LED kit coming for my old Singer. It should be here any day and I can't wait! I am very interested in adding some extra lighting to my work area for my Baby Lock Melody. I had no idea anything like this existed! Thank you so much for the heads up! And I thought it was just my old eyes! I too sew with a light in front of, and sometimes in back of my machine. Thanks for showing me something new and better! I absolutely love my LED lights! I've had mine for about a year, and it has saved the day....and space.